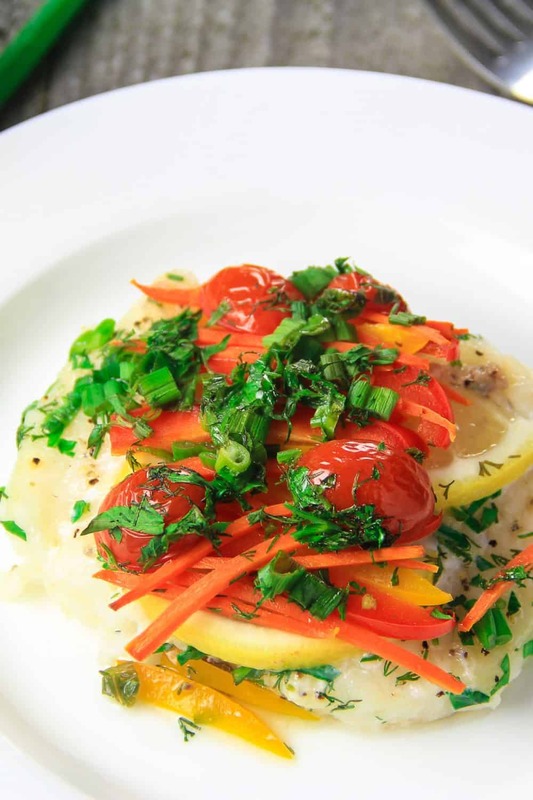 This buttery baked cod has the aromatic flavors of lemon, garlic, and dill. Pair it with some roasted veggies and pilaf and you have an amazing and easy dinner. 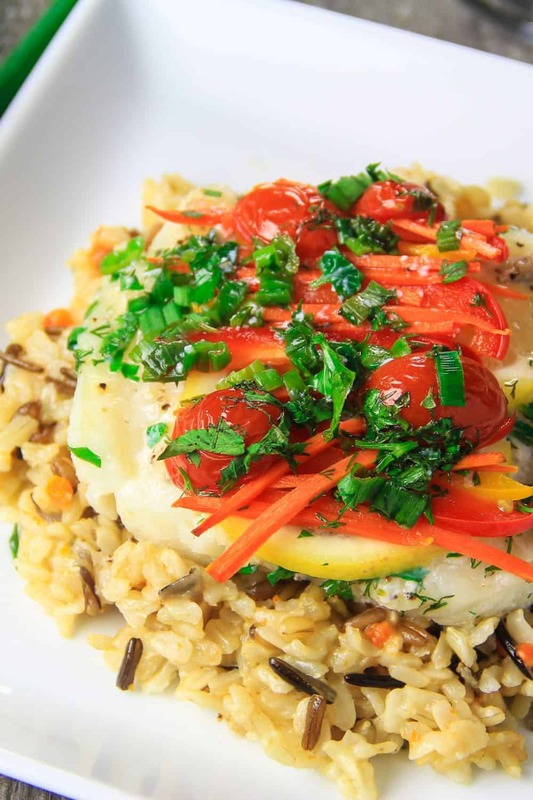 Serve my baked cod with wild brown rice for a light dinner that will still fill you up. This recipe was originally posted March 23, 2015, we’ve tweaked it a bit since then. This post may contain affiliate links. Read my disclosure policy here. I’m not a huge fan of fish but when prepared well, I don’t mind eating it. This recipe is very healthy because it’s packed with protein and loaded with a variety of vegetables. The colorful vegetables also make it a beautiful dish to serve at dinner parties. 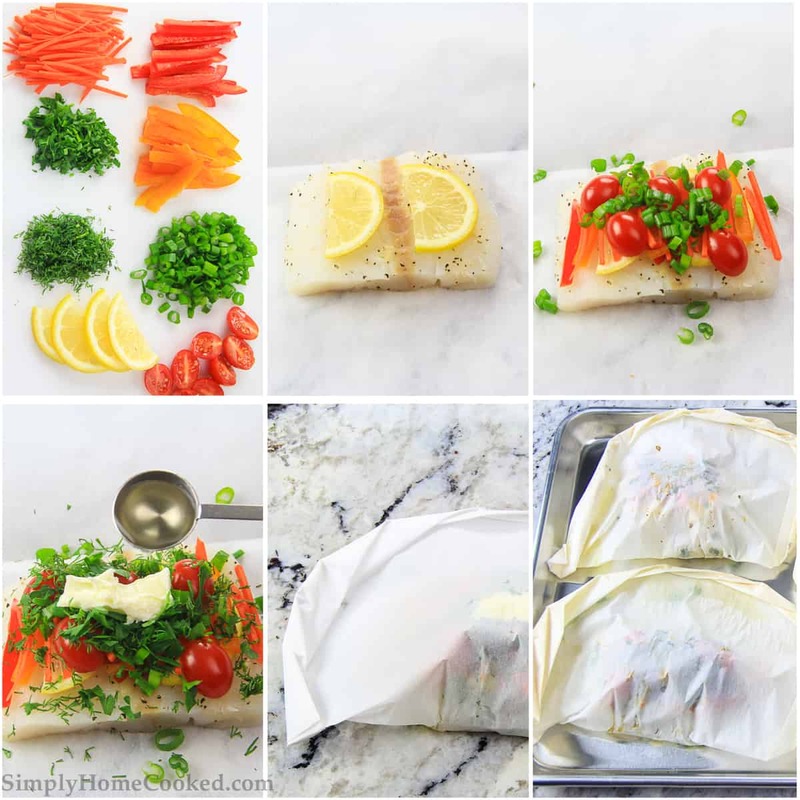 This cod may take a little bit of time to prepare because it’s tightly folded into a sheet of parchment paper before being put in the oven to bake. Although the preparation might be time-consuming, it only cooks for 10 minutes and the taste is so worth it. To make a really juicy and flavorful fish that is perfectly flaky, bake it in the oven. To do this, lay the fish on a piece of parchment paper. Then, put the butter, lemon, and spices on top. Wrap the fish up in the parchment paper, like little packets. This will seal in the flavors. Finally, just bake it all for about 10 minutes in a 390-degree oven. How long do I bake cod? When the oven is properly set and all warmed up, it won’t take long. It only took me about 10-12 minutes in a 390-degree oven for my cod to cook completely. What sides go well with cod? Cod is such a light fish that other light sides pair well with it. Think of delicate grains like brown rice or quinoa. 1. Cut the lemon, carrot, bell peppers, and tomatoes. Then chop the green onion, dill, and parsley. 2. Cut 4 pieces of parchment paper and fold each in half just to make a crease. Then place a thin slice of butter on the bottom half. 3. Place the cod fillet on top of the butter and season it with salt and pepper. Then spread the zested garlic on the fish. 4. Add a slice of lemon on top and begin adding a thin layer of bell peppers, carrots, cherry tomato halves, green onion, dill, and parsley. 6. Fold the parchment paper back over and begin making small folds along the edge so that you end up with a half circle. 7. Once all of the fillets are tightly folded into the parchment paper, place them onto a baking sheet and bake in the oven. Cooking time may vary depending on the size of the fillet. Note: If you prefer to use a different fish, halibut is a great substitute for this dish. Cut the lemon, carrot, bell peppers, and tomatoes. Then chop the green onion, dill, and parsley. Cut 4 (15 x 15) inch pieces of parchment paper and fold each in half just to make a crease. Then place thin slice of butter on the bottom half. 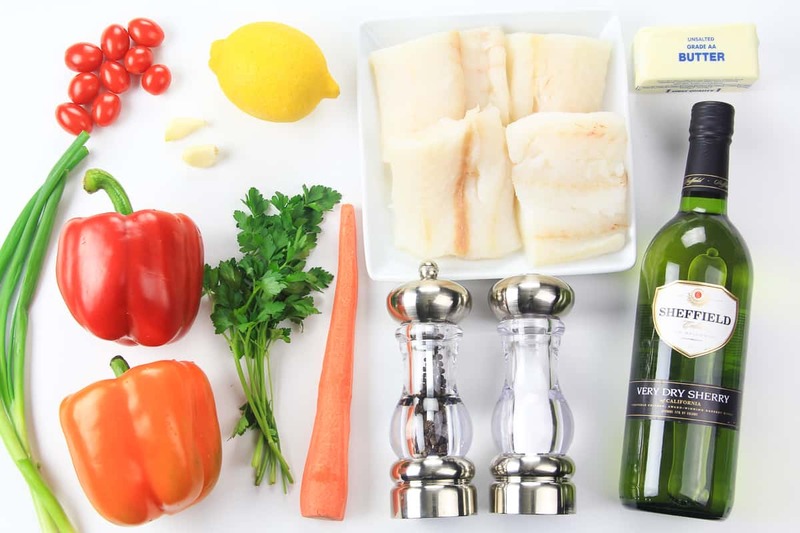 Place the cod fillet on top of the butter and season it with salt and pepper. Then spread about 1/4 tsp zested garlic on the fish. Add 1 slice of lemon on top and begin adding a thin layer of bell peppers, carrots, cherry tomato halves, green onion, dill, and parsley. Add another thin slice of butter and 1 tbsp of dry cherry on top each cod fillet. Fold the parchment paper back over and begin making small folds along the edge so that you end up with a half circle. Once all of the fillets are tightly folded into the parchment paper, place them onto a baking sheet and bake in a 390 degree oven for 10-12 minutes. Cooking time may vary depending on the size of the fillet. I usually don’t cook….however I enjoy very much this recipe! Thank you!